The iconic "Concord" Air Jordan XI is set to return next year as a low top for the first time. The "Concord" Air Jordan XI is my all-time favorite shoe. I stocked up in 2000 when they first were retroed, picked up a couple DMP's in 2006 and added multiples once again in 2011. Now after years of people asking for it, it's finally going to happen. A "Concord" Air Jordan 11 Retro Low. Remaining true to the OG in look these are sure to satisfy everyone's cravings after MJ teasing us with his PE pairs the last couple of years. A general release, look out for these at select Jordan Brand accounts worldwide on Saturday, May 3rd, 2014. Retail is set at $150 for men's and, they will also be available in full family sizing running down to toddler. 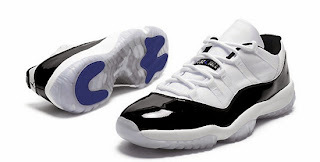 Enjoy the image below of the "Concord" Air Jordan 11 Retro Low in white, black and dark concord. If you're interested in picking these up when they release, check in with your local spots to see if they will be receiving them. Those of you looking for a pair now can, grab them from eBay here.